15 Pretty Tunics To Make Even Basic Leggings Look SO Stylish! Don’t we all have that one pair of black leggings we wish we could wear indefinitely? If you’re bored of wearing the same old tops and kurtis with your leggings, we have a solution for you! Here’s our compilation of 15 tunics you can wear with black leggings and look effortlessly chic and comfy at the same time! An off white kaftan with orange embroidery is the perfect combination of dainty and comfy for a long, hot day! With drawstrings at the waist that’ll make you look slimmer, this kaftan tunic is a summer essential for every girl. Price: Rs 2,899. Buy it here. A new age tunic for the new age girl! 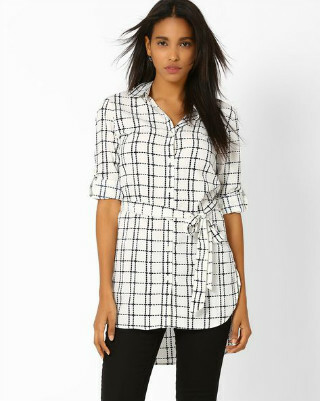 Add a contemporary edge to your outfit with this side slit checked tunic. Wear it with espadrilles for the perfect chic look. 3. Embellished With Pom Poms! A sleeveless printed tunic with rich hues and embellished pom poms! We have reasons more than one to love this tunic. This unique piece will definitely make you look a class apart from the crowd. Price: Rs 1,899. Buy it here. 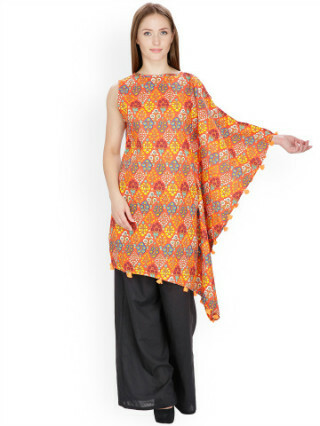 This leheriya print tunic top is a perfect pick for the days you want to don the Indo-western look. 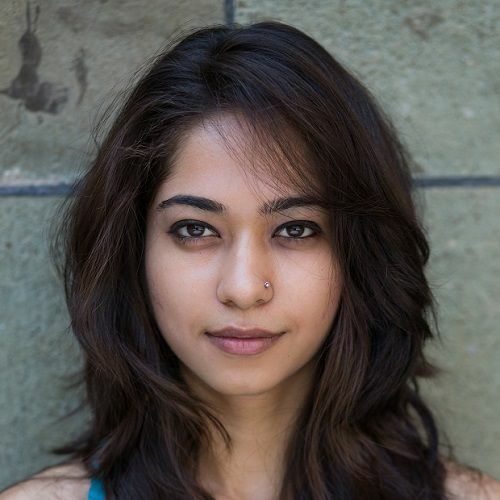 Complete the attire by accessorizing it well with jhumkas or silver bangles! Price: Rs 1,199. Buy it here. 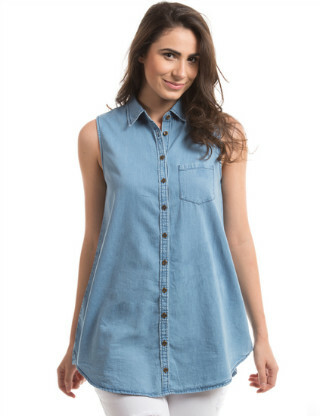 A sleeveless tunic with a modern twist! With an inner contrast hem, this high-low tunic is a great buy for the days you want to turn a few heads, be it at work or at a social gathering! Price: Rs 999. Buy it here. 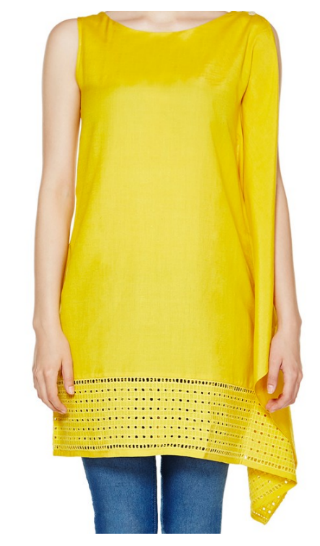 This yellow printed tunic is just what you need to beat the heat in style! Covered in a beautiful abstract print, this tunic has so much scope for experimenting! So go ahead and try different accessories with it every time! Price: Rs 1,499. Buy it here. Look comfortable and classy at the same time in this shirt tunic. Perfect for the workplace or an important day in college! You will definitely be taken seriously in this outfit. The perfect pick to turn your gloomy days into really bright ones! 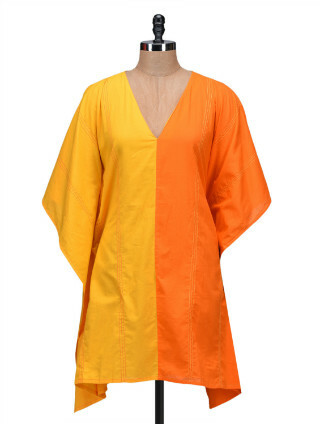 Look happy, comfortable and colourful in this yellow-orange kaftan. We absolutely love how this piece is so simple and yet so edgy at the same time. Price: Rs 499. Buy it here. A pink front-button shirt with a collar and tie-up detail on the waist is a sure way to make a style statement! A great choice for the days you want to keep it simple. Price: Rs 999. Buy it here. This sleeveless tunic with a left faux sleeve is the definition of comfort and style! Add some sunshine to your look with this trendy tunic. Price: Rs 1,599. Buy it here. Who said you can’t pair black with black? Wear this black ethnic tunic top and don’t forget to wear your favourite jhumkas for the contemporary desi girl look. Price: Rs 1,899 Buy it here. This floral tunic top will bring life to your outfit! Florals never go out of style, right? So go ahead and glam up your look with this one. Give the crowd a cold shoulder with an ethnic twist! This one shoulder tunic will definitely make heads turn wherever you go. Price: Rs 1,599. Buy it here. Ethnic tunics never fail to make you look your most elegant self. So what are you waiting for? Go grab this maroon tunic that’ll go well with your leggings, jeans and even a salwar! Price: Rs 1,199. Buy it here. Denim tunic tops with black leggings are a can’t-go-wrong! And guess what, we love it! Wear it with black leggings and carry a funky tote bag to complete the look. Price: Rs 1,499. Buy it here. Featured Image: Shutterstock A place where girls can talk about ANYTHING. (No guys allowed!) ? ? Get the POPxo app NOW on Play Store and iOS App Store.